I’ve driven past it without taking much note dozens of times. But I finally got a chance to stop and explore the Jay Covered Bridge earlier this year, and I was thrilled that I did. The site of the bridge is gorgeous. There’s a beautiful little park with benches and a roomy parking area, there’s wonderful signage around the bridge that explains its historic significance to the area, and the river rushing under it is just breathtaking. And of course, the historic covered bridge itself is super impressive! 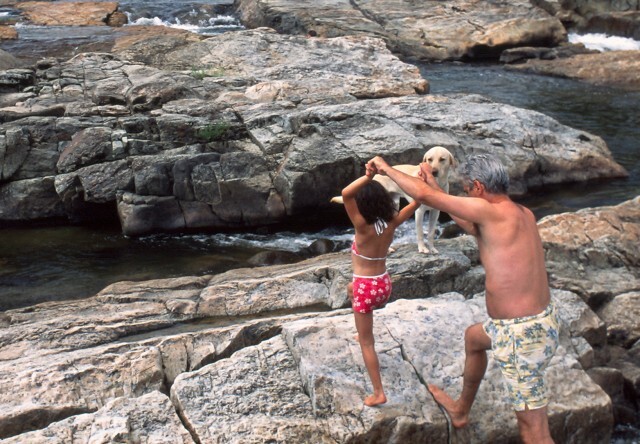 The bridge spans the East Branch of the Ausable River, and the area below the bridge is a very popular one for swimming. There are plenty of rocks to sunbathe on and to jump off, and deep pools of refreshing water in between. There’s even a natural waterslide or two, depending on how high the water is. But though it draws many swimmers in the heat of the summer, there is no lifeguard, so visitors need to be careful there. Unfortunately, I visited it in January, so it wasn’t exactly prime swimming time. But I’m known to be a bit of a connoisseur of swimming holes, so I’m definitely going to have to head back this summer to evaluate the take-a-dip-ness of it. But on to the coolness of the bridge! As I said, I visited in January, so it’s one of those awesome attractions that can be visited year round. In the winter, it’s decorated with lush green wreaths. 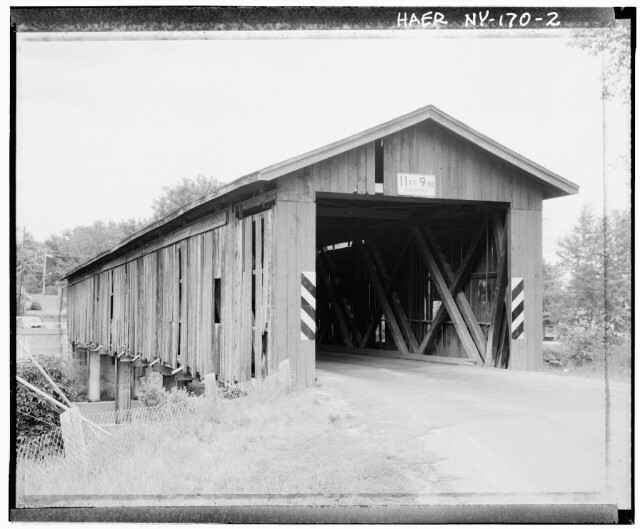 Starting in the early 1800s, the state was once dotted with covered bridges. According to a website that deals entirely with covered bridges in the state, they were covered in order to protect trusses from moisture, keeping them strong and making them last much longer. But despite their strength, most of the state’s covered bridges have been destroyed by nature or replaced with a more modern design. The Jay Covered Bridge is the last one in the Adirondacks, and today it’s the longest one of the 22 that remain in the state. 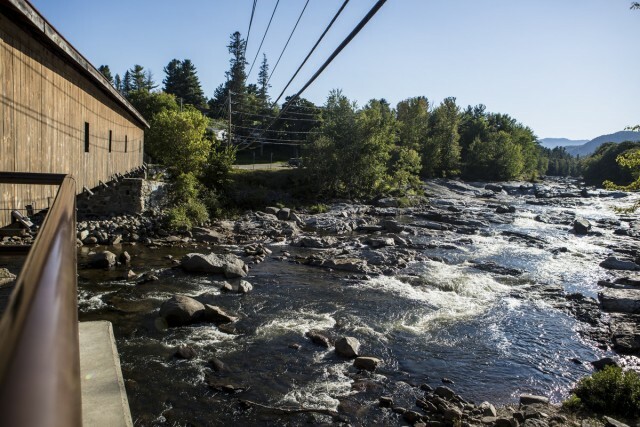 The covered bridge was originally built as part of an industrial district that included grist mills, saw mills, and several forges that took advantage of the plentiful iron ore deposits in the area. The bridge is not the first one in that location. Most of a previous bridge was swept away by the rain-swollen river on Sept. 30, 1856. So in 1857, engineers were faced with a difficult task: rebuilding the bridge so it wouldn’t get destroyed once again. Ausable Forks resident George M. Burt won the contract to rebuild the bridge. Burt built a 160-foot-long Howe Truss bridge made of hand-hewn timbers to connect the two sides of the bridge that remained from the previous one, making the entire bridge about 240-feet long, according to historic documents filed with the Library of Congress. The new cover was added in 1858. The truss system consists of a series of crosses formed by thick, sturdy wooden beams placed next to one another. A frame is built around the crosses, and wood panels cover the outside of them in vertical slats. 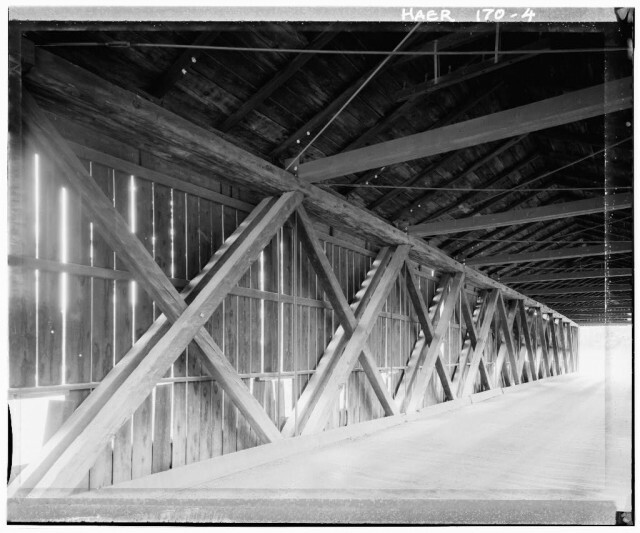 The Howe Truss is known for incorporating vertical iron tension rods instead of the traditionally used wooden panel uprights to serve as light, strong counter-bracing that strengthened the bridge and increased its capacity. The older parts of the bridge were removed after an overweight truck broke through the deck in 1953. Those parts were taken out and replaced with a concrete approach to the bridge that’s filled with earth. 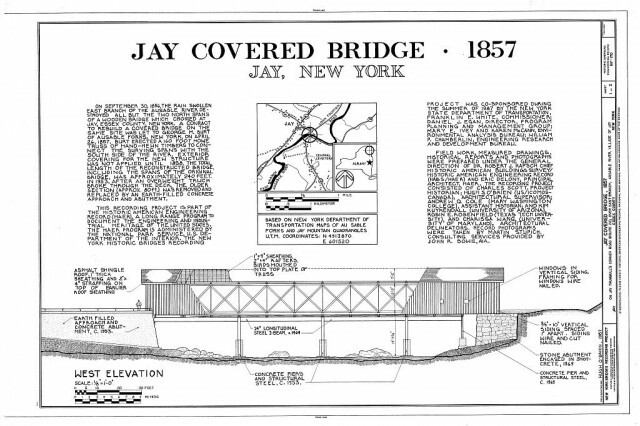 In 1987, historic documents and photos regarding the bridge were recorded at the Library of Congress as part of a widespread program to document the engineering and industrial heritage of the U.S. 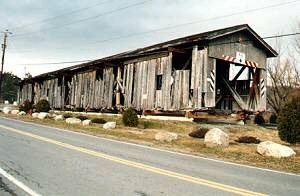 According to a 1993 story in the Adirondack Daily Enterprise, a Pepsi delivery truck that lost its breaks going down the Route 86 hill above the bridge barreled through the bridge and broke a number of trusses in the ceiling, leading to $20,000 in repair work. The newspaper story also recounts a group of partying adults in 1992 broke off pieces of the bridge and piled the pieces into a teepee as if to start a fire, but they were scared away before they did so. Officials tried to put the wood back as best as possible. Throughout all that time, the bridge was open to vehicle traffic, though the size of vehicles passing through it was limited at various times. But on May 14, 1997, the bridge was closed to all traffic. It was then dismantled and set off to the side in four pieces. In the early 2000s, Essex County, which owns the bridge, partnered with the state on a full-scale restoration project. 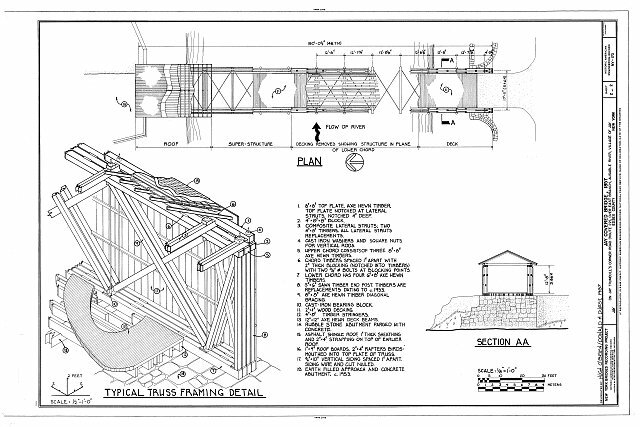 It created a deep-seated controversy throughout the town at the time, with some locals advocating for the bridge to be rehabilitated and upgraded so it could bear traffic and others arguing for a new bridge for traffic alongside a historic restoration of the covered bridge, then there was argument over where the new bridge should go. 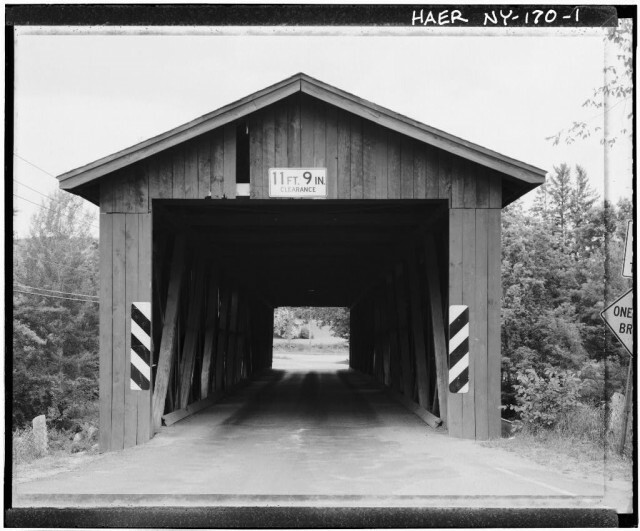 In the end, the New York State Department of Transportation ended up building a modern bridge 400 feet downstream of the covered bridge site and historically restoring the covered bridge. The renovated covered bridge used as much of the existing bridge as possible, and deteriorated timber was replaced, including all the roof framing and ceiling beams, roof and wall sheeting, and most of the deck. The bridge was elevated, and the landscaped area around the entrance was constructed with interpretive signs telling about Jay, the bridge, and the area’s history. It was reopened in October 2007 to much ceremony. Today, the bridge is only open to pedestrians and bicycles. It’s amazing to me to think that, even though it has been changed and refurbished plenty over the years, this wooden bridge still exists from the 1850s! Walking across it is like traveling back in time!